Rabadi’s passion in the beauty industry extends to making individuals feel beautiful and confident about themselves. 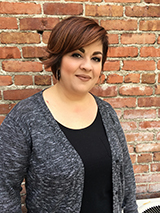 Rabadi is dual licensed as a Stylist and Esthetician. She has experience in Aveda Color, Aveda Skincare and Aveda Makeup. The beauty industry is constantly evolving and Rabadi makes it a priority to seek out new learning opportunities to broaden her knowledge base and is well versed in the current trends. Rabadi believes that her guests should be treated with the highest levels of professionalism and customer service and strives to provide them with the highest quality of service.